For anyone who’s a sucker for Italian food like me, going to Napoli (or Naples) is the kind of trip where you can count on returning home with a bigger waist size. For the whole week I was there, all I did was eat! Authentic Neapolitan pizza is something you’ve just got to try when you go, and after my experience in Napoli every other pizza I’ve eaten tastes boring in comparison. That’s why I was glad to find Santa Maria, an authentic Neapolitan pizzeria close to home in Ealing, London. A small and cosy restaurant, Santa Maria is a big contrast from the fancy setups of the pizza chains you may be used to. 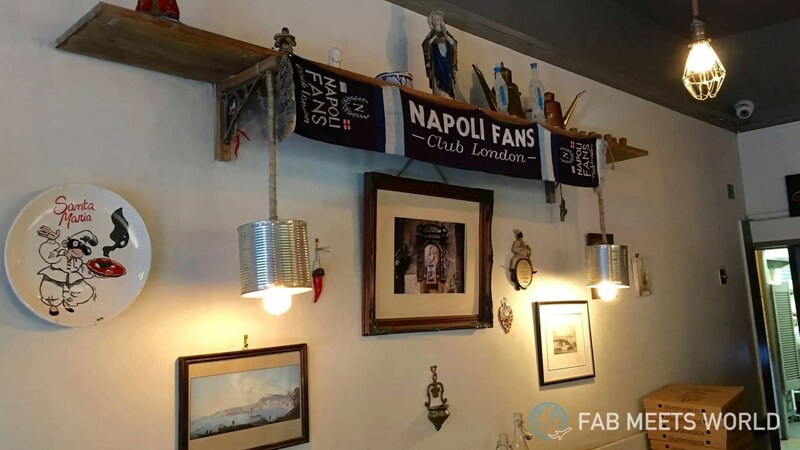 From the Napoli football club scarf and religious statues/artwork on the walls, to the Italian music and Italian-speaking staff, there’s a very authentic vibe to Santa Maria pizzeria. It’s got this simple and rustic feel to it that makes me feel like I’m dining at a family-run restaurant in an Italian side-street. I love it! The food in Santa Maria is incredibly tasty. 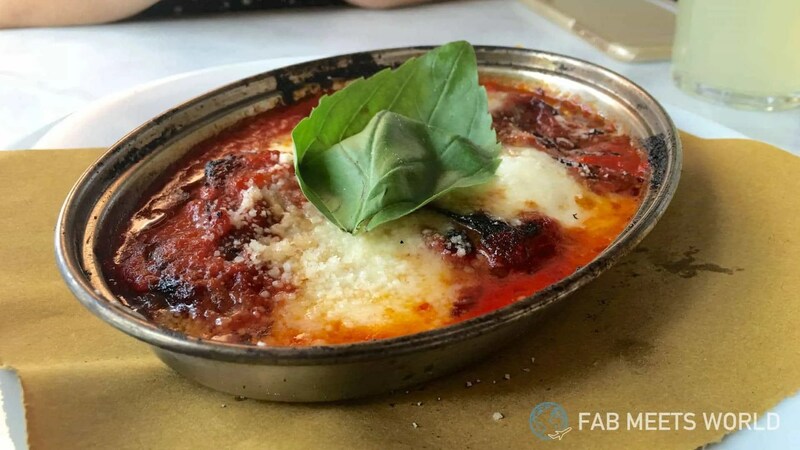 I ordered an Aubergine Parmigiana for starters — layers of aubergines cooked in olive oil, with tomato sauce, mozzarella, parmesan cheese and fresh basil — which was nicely sized and rich in flavour. Typically Italian, the tomato sauce was very flavoursome and the layers of stretchy mozzarella make you feel like you’re in cheese heaven. My star of the show was the “Santa Bufalina”, a pizza with tomato sauce, buffalo D.O.C. mozzarella, extra virgin olive oil, parmesan and fresh basil. A simple selection, I know, but the rich tomato sauce works so well with that buffalo mozzarella that it doesn’t actually need any other toppings. And this is coming from someone who typically loads on 5+ toppings on his pizzas! The Santa Bufalina is simple but so very tasty. Highly recommended! 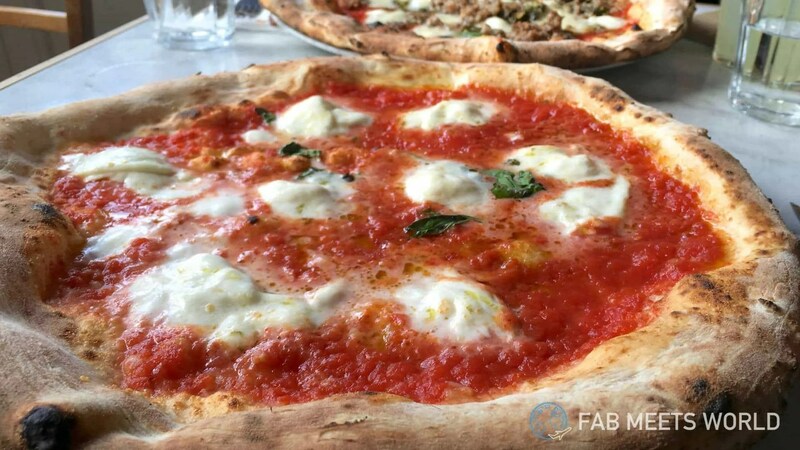 Just like the pizzas I ate in Napoli, the base in Santa Maria is very thin but rounded off with a thick, soft and chewy crust which tastes amazing. Thanks to the wood-fired oven (imported all the way from Italy), you even get this lovely charred taste when you bite into the crust. It’s so damn good when you dunk the crispy parts of the crust into the leftover tomato sauce. 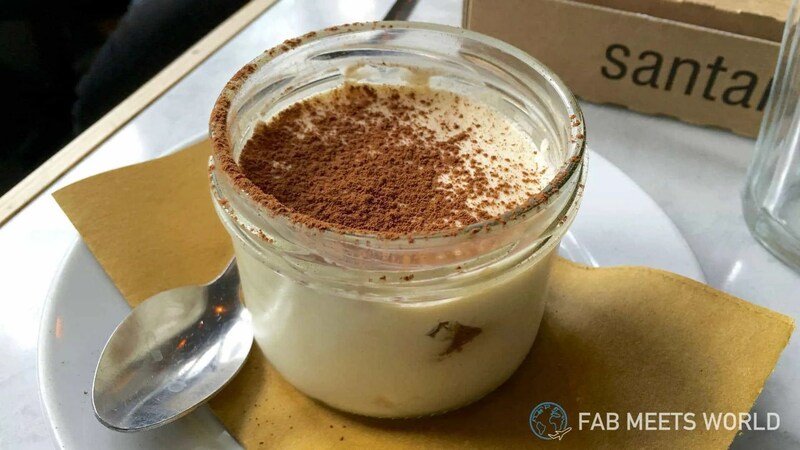 If you still have room left after your pizza, I’d highly recommend going for the Tiramisu too. It’s one of the better ones I’ve tasted, including the ones in Italy! Visit Santa Maria at peak times and be prepared to wait; this little place can only seat about 20 people at once, so you’re bound to be waiting in a queue for a while. However if you’re looking for a taste of authentic, Neapolitan pizza without having to fly all the way to Italy, do yourself a favour and head down there — you won’t regret it. The prices are very reasonable (around £6-9 per pizza), food tastes delicious and you get a truly Italian experience. I can’t recommend it enough. A real geek at heart, Fabio caught the travel bug after traveling for a month in the summer of 2015. After visiting 4 different places in 4 weeks, he decided to leave his job, become self-employed and see all the world has to offer!